Donald Trump Jr. told Fox News' "Hannity" Thursday night that former FBI Director James Comey's testimony before the Senate intelligence committee Thursday was the culmination of a "10-month witch hunt." "This is the only thing that they had on Trump," the president's eldest son said of Comey's role in the investigation into Russian actions during the 2016 election. "This is what they did to distract him from being able to get the stuff done that he was elected to ultimately do, and I think now that this has all passed, he can go back to doing what he promised he was going to do." The younger Trump said Comey's credibility "has to be shot" after his testimony, which centered on a Feb. 14 meeting between the president and the then-FBI director after the resignation of Michael Flynn as national security adviser. 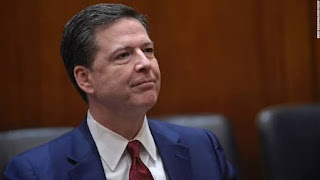 Referencing Comey's failure to confront Trump after allegedly being pressured to end the FBI probe of Flynn, Trump Jr. said, "The head of the FBI goes, ‘Well, if I was a stronger man' ... I mean, what kind of response is that? ... Not, ‘Hey, maybe I should follow the law and procedure and say that Trump was doing this. Maybe I should let him know that this was happening.’ But instead, he decides to do this." The president's son claimed the spectacle of the hearing was likely to turn off voters and make them more sympathetic to Trump. "Reasonable people are seeing that this has just been one big witch hunt. They see how disgusting the swamp really is," he said. "They see the teeth that are there, and I think they’re going to realize that, ‘Hey, give the guy a chance. Let him do what he was elected to do, and he’ll do a phenomenal job.'"